Gauri Gill, Untitled (27), 2015–, ink-jet print, 28 x 42”. From the series “Acts of Appearance,” 2015–. 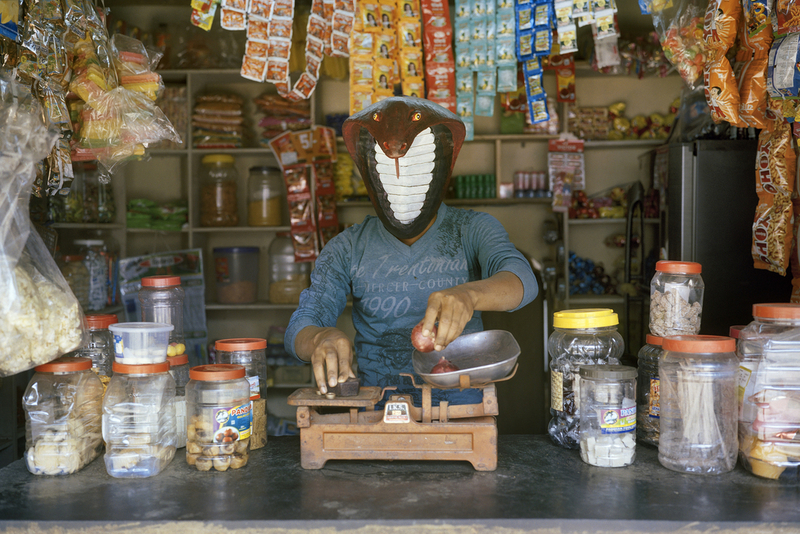 Over the past three years, the photographer Gauri Gill has worked with a group of thirty-three artists, including mask-makers and volunteer actors, from a community of adivasis—or indigenous people—in India’s Jawhar district. The resultant and ongoing series of staged color photographs, “Acts of Appearance,” 2015–, debuted at Documenta 14 in 2017. Here, Gill talks about the work, which is on view at MoMA PS1 in New York until September 3, 2018. WHERE IS THE SPACE for artists outside of our city bubbles to be free to innovate and experiment? Perhaps this project has provided room to converse across forms, to be free to have fun and play a little. That is normally a liberty only afforded to so-called contemporary or English-speaking artists—those of us who have been to art schools and can participate in a certain discourse. The artists involved in these pictures work with papier-mâché and make masks for local ritualistic performances and decorative objects that are for sale at rural fairs or tribal shops. I’m an artist who works with photography. That may be the only real difference between us—and, in a way, photographs are masks too. The question is: Can they—as members of an adivasi community of outsider artists, who deal with injustice at every level—be recognized and seen as artists, and not as craftspeople or further framed as tribal or folk artists? The specific settings of the works are important to me, but at the other end of the spectrum, so is a sense of the psychological interior. There’s a picture of a man brooding in the show, for instance. My brother loved it and said: “That’s me. I completely identify.” There are so many experiences common to human beings, and all of us must be allowed the freedom to explore interiority or abstraction or whatever else we like. Can our project simply represent co-citizens of our so-called democratic country, speaking to each other across distinct mediums? I hope the work is not about othering, because those are the circumstances—of the grotesque structural inequality that exist. I’m interested in the human strategies through which people survive the precariousness: expressions of humor, resistance, and uncanny beauty. That’s what my photographic series “The Mark on the Wall,” which shows drawings in schools in Rajasthan, addresses too. In the remotest of schools with threadbare resources are these drawings of vitality and creativity. I’m interested in how people find ways to swim and stay afloat; it’s not about the drowning. The masks are as much about revealing as concealing the conversation between us and the voices or very particular imaginations that come through. Otherwise, one could just as well do it all digitally. In fact, they’re personal interpretations by artists, created through a process of dialogue. Sometimes the makers also inhabit them. Underneath the visual expression is the unknowable person. I’m always interested in exploring the real, but also the impossibility of representation itself. There is the face behind the mask, and potentially at this moment that face is the most unselfconscious it will ever be, because it is unobserved, even by the wearer herself. But we will never see it. In a way, the audience has entered the frame. If the classic trope is that I am the photographer, and there is the subject, and there is the audience, then I want the spectators to be onstage, to break through and speak back.